75 years ago, the world was introduced to Diana of Themyscira, Princess of the Amazons, and the superhero known as Wonder Woman. Debuting in All-Star Comics #8 in December of 1941, Wonder Woman – created by William Moulton Marston, with help from his wife Elizabeth – soon achieved the status of lead character starting with Sensation Comics #1 in January of 1942. 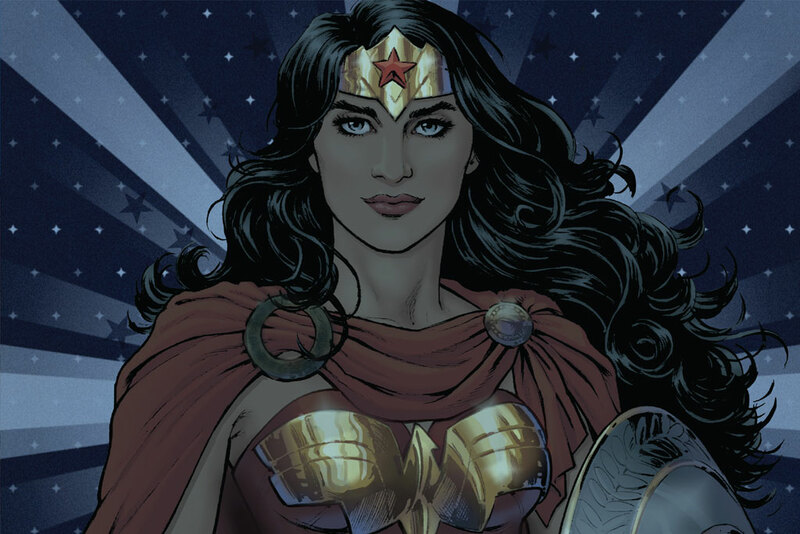 A Nazi-fighting Amazon blessed by the gods of Greek mythology, Wonder Woman was the embodiment of Marston’s ideal woman and his personal philosophy of utopia in which women were the dominant power. Smart, strong, athletic, kind, loving, beautiful, and peaceful only describe some of the traits Wonder Woman has been associated with over the last 75 years. 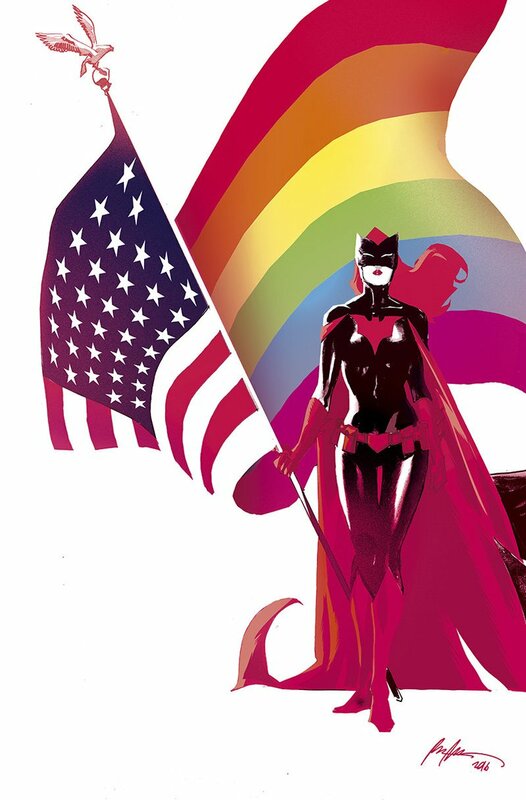 She’s worn many hats as DC Comics’s most well-known superheroine, and certainly her solo title and character progression have taken some roller coaster rides, but like Superman and Batman everyone has a version of Wonder Woman they can call their own. Hero, Princess, Warrior, Diplomat, Demigod, Daughter, and Friend, Diana has been many things to many people. Today, however, she’s an honorary ambassador of the United Nations. Wonder Woman symbolizes many of the values of women’s culture that feminists are now trying to introduce into the mainstream: strength and self-reliance for women; sisterhood and mutual support among women; peacefulness and esteem for human life; a diminishment both of “masculine” aggression and of the belief that violence is the only way of solving conflicts. As part of the celebration, the U.N. invited Lynda Carter and Gal Gadot to speak on behalf of the character both have brought to life on the small and big screen. 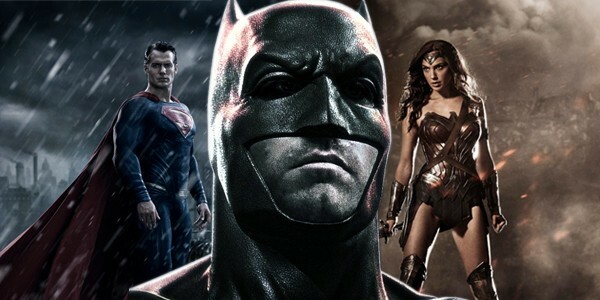 Carter, though not the first to play Diana, certainly had the longest live action run on, naturally, Wonder Woman, which ran from 1975 to 1979, and Gadot recently appeared as the lasso-wielding demigod in Batman v Superman: Dawn of Justice with her first ever solo film set to premiere in June 2017. 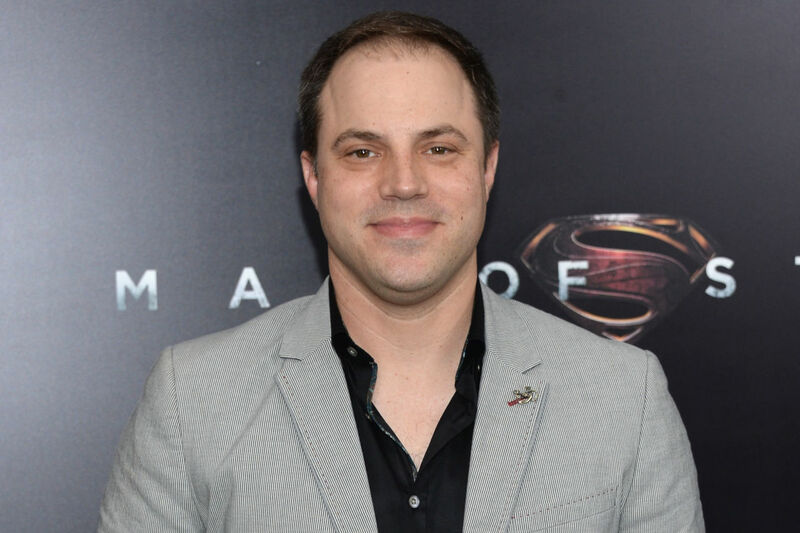 They were joined by the 2017 movie’s director, Patty Jenkins, as well as DC Entertainment President Diane Nelson, though I suspect there were plenty of artists and writers invited to the ceremony if Twitter is to be believed. While this is certainly not the first time Wonder Woman has been part of campaigns for women’s rights or had her iconic image used to make an impact, this does mark her first official sanction as the Honorary Ambassador for the Empowerment of Women and Girls. One of the ways DC Comics plans to fulfill that responsibility is by producing a comic book for release in 2017, distributed via the U.N., and translated into the six official languages of the organization; namely Arabic, Chinese, English, French, Russian, and Spanish. 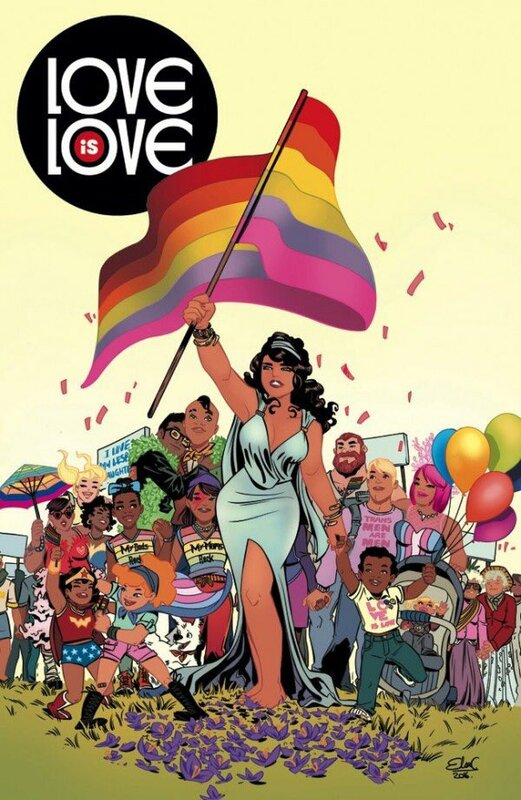 Also ready for release next week, DC Comics will release a 75th Anniversary book next week featuring the writing and art work of well known comic book pros like Rafael Albuquerque, Brian Azzarello, Cliff Chiang, Renae De Liz, Brenden Fletcher, Adam Hughes, Karl Kerschl, and Gail Simone. It’s a good cap to a celebration for such an iconic character who is finally getting her due. Hopefully, next year we’ll be talking about how amazing her solo film was and speculating about its inevitable sequel. Fingers crossed. 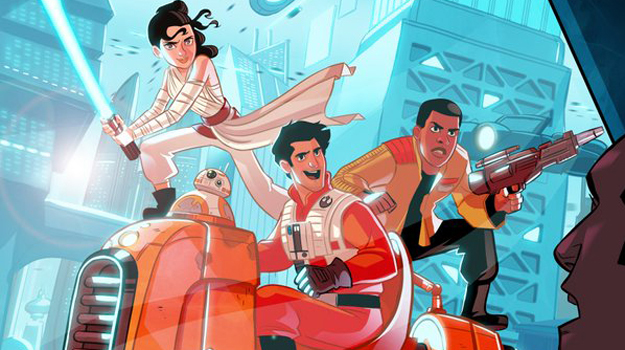 With his latest Animated Adventures trailer for Firefly sparking flames of rekindled love for the short-lived Joss Whedon sci-fi western, artist Stephen Byrne has gotten a bit of a pop culture visibility boost with a multitude of websites praising his work while demanding his trailer become a reality. He takes it well, though, celebrating the outpouring of love with his own earnest gratitude and humility. A man of many fandoms (aren’t we all), Byrne infuses heavy doses of joy and energy into his work, bringing smiles even to the grimdark worlds of some more notable characters we’ve seen grace the big and small screens. I reached out to Byrne recently and he was kind enough to answer some questions about his work, fandom, and the “infamous” kiss. Maniacal Geek (MG): For those out there who may not be familiar with your work (i.e. those living under rocks and in caves), could you explain a little bit of your background as an artist and animator? 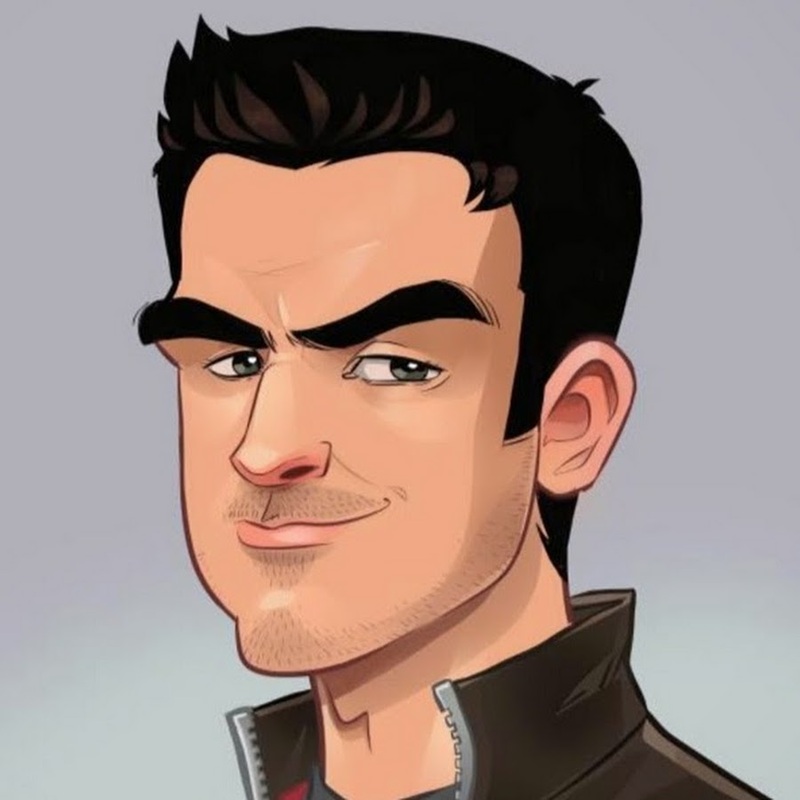 Stephen Byrne (SB): Sure, I studied animation in Ireland at the Irish School of Animation. I’m from Dublin originally. I studied there for 5 years and then did some work in the animation industry, before falling into games and now moving more into the comics industry. MG: What was the first fandom that inspired you to make fan art? Was it the world itself that inspired you? The characters? Both? MG: The Animated Adventures of Firefly has gotten a huge response from fans, media outlets, the original cast, etc. What has surprised you the most about this outpouring of love for the trailer? SB: Maybe Nathan Fillion retweeting? Although I was hoping for that because I know he’s pretty active on social media. Actually more the fact that he sent me a tweet that indicated that he found the whole thing quite meaningful. I look at it as a bit of fun, but the amount of comments and messages I got from people having intensely emotional responses to it was surprising, but that’s down to what Joss Whedon did, not what I did. MG: You’ve done a few Animated Adventures trailers (and a tease for Harry Potter), but what’s the most difficult aspect of distilling such expansive worlds into videos that last less than a minute? What do you try to focus on? SB: Uhhhhh it’s kinda all over the shop. I usually have a basic outline of what I want to do overall. I want to put in a few time-consuming shots that will be challenging to do. But then it becomes more like ‘what can I do quickly that will look shiny?’. Because I work full-time, the whole thing is pulled off in evenings and weekends over a long period of time, so it’s easier to do a spaceship with some zoom lines flying past than it is to do River doing acrobatic insanity. MG: Gushy statement: I love the way you use lighting and bold colors in your work! So much is captured in a page or a headshot with the moods and tones you create. Actual question: Do you like to challenge yourself with technique? Was there ever a project that pushed you to change how you approach your art? Or have your style and methods been pretty solid and steady? SB: Thanks! Funnily enough, color used to be a trainwreck with me. I was like ‘grass is green, sky is blue’ and it all looked very garish. I was determined to figure it out but it developed over many years and is now probably the thing I get noticed most for. As for challenging myself with technique – always. Every thing I do is an attempt to improve on the last thing I did, in some small way. I’m always looking for improved approaches. MG: Your fan art comics for Spider-Man, Star Wars, and the DC Trinity have caught a lot of attention as well, the Trinity comic especially for the “surprise” ending. Do you go in with the intention of subverting expectations or do these stories write themselves as you go along? SB: The ending to Trinity changed halfway through. And it wasn’t even my idea. A friend in work said it would be funny if Batman was actually jealous of Wonder Woman. I was like ‘yep that’s way better’ and rejigged the story from that point, so it became a little longer, but better. Star Wars Episode 7.5 was all built around the Jar-Jar reveal. That’s the whole reason I did it. I was thinking it would be fun to do something Star Wars-y. I had really enjoyed the new movie. And I was envisioning the story in my mind and I got to the moment when Kylo Ren turns around and I was like ‘wouldn’t it be interesting if it was some else?’. That was the moment I actually decided to go ahead and draw the thing. I have lots of ideas flying through my brain at any given time, but only a limited amount of hours to do them, so yeah, I do pick things that I think will get a reaction. 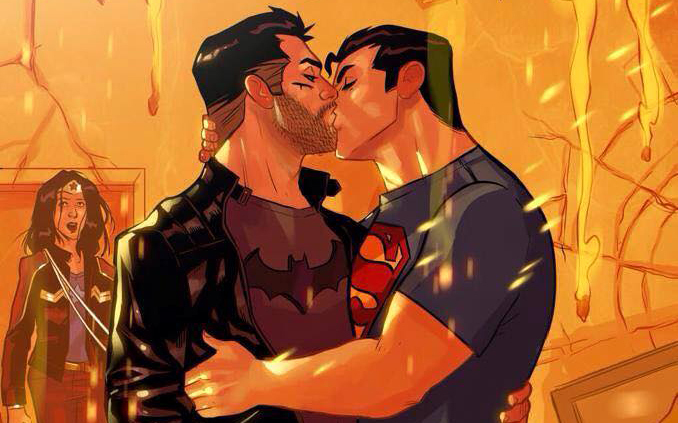 MG: And because I’m morbidly curious, what was the overall response to the SuperBat kiss? 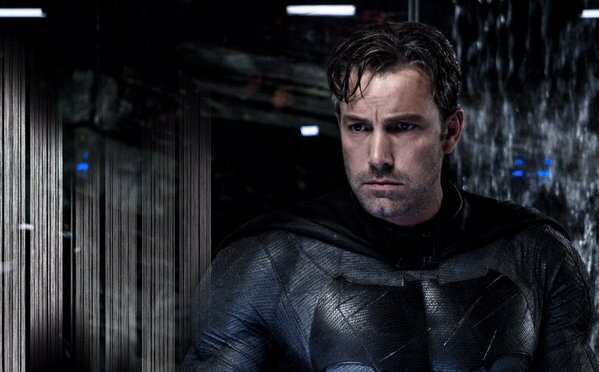 Did you experience backlash from the dark side of fandom? How does that aspect of fandom push you creatively? SB: Naw it wasn’t too bad. There were some commenters that were like ‘WTF? GAY.’ Very astute people. There were only a couple of vitriolic hateful comments, which I will delete or block or whatever. But I enjoy negative responses generally, because they are either rooted in some sort of fan outrage, which means they care about what I’ve done, or they are constructive criticism (less often) which means you can learn from them. MG: You seem to live and breathe superhero and sci-fi genres with a good portion of your work, but is there a genre you haven’t really tackled that you’d like to? 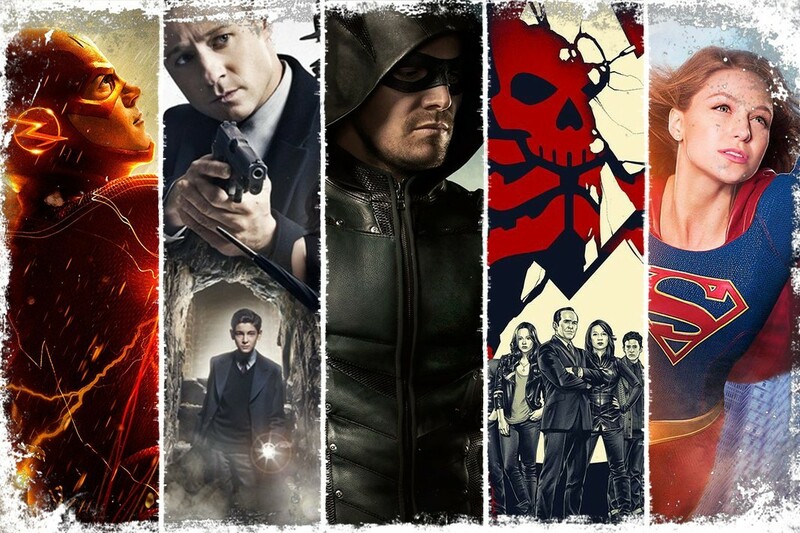 SB: I’m a superhero comic nerd. That’s my jam. I could see myself doing an indie ‘real world’ comic but I think you can say more about the world and speak more honestly through a genre filter. I may get tired of it but it hasn’t let up in the last 20 years. MG: Your first of two Green Arrow issues came out last week, so congratulations! What challenges and triumphs do you find working on mainstream books vs indie or creator owned projects? Any other DC characters you’ve always wanted to tackle? MG: You’re also working on a creator-owned sci-fi book with Dan Slott. Any information you can give about it or is it still a bit hush-hush? SB: Nope I can’t say anything about that at all! Sorry! Except that it is gonna be AWESOME. 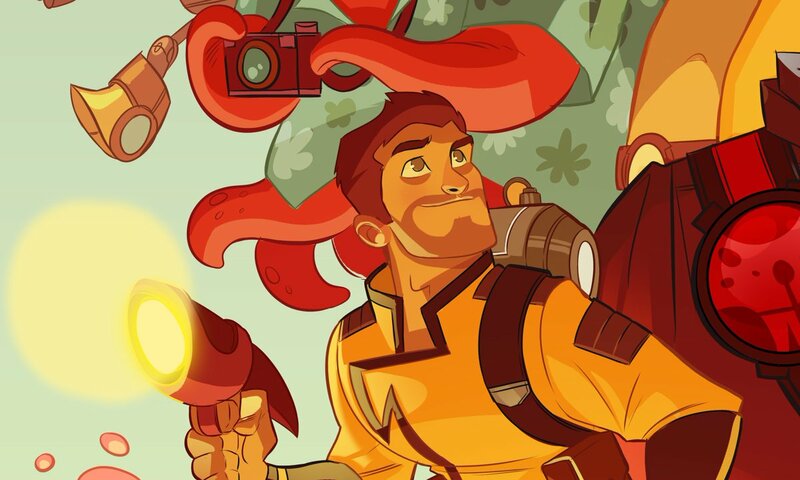 I’d just like to say thank you, again, to Stephen Byrne for being gracious with his time despite his busy schedule. I needed to do a fun article. 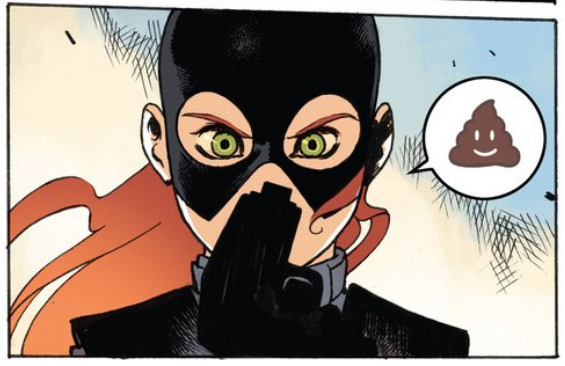 It’s been a weird couple of weeks in the House of Sam, so I’m gonna talk about one of the stranger and yet awesome categories of comic book characters – Gorillas. No, not the beloved alternative/hip hop/electronica group, but rather our gloriously rendered, hyper-intelligent simian cousins who populate the world of DC Comics. While television viewing fans have come to know of frequent Flash villain Gorilla Grodd, it’s worth noting that the comic book universe home to the Scarlet Speedster has at least six sentient apes running around with the goal of either helping or hindering our favorite heroes. And with the possibility of more apes appearing on The Flash via the proto-Gorilla City of Earth-2, I thought I’d give all you lovely people a rundown of villainous and heroic primates with the potential to grace our small screens, or maybe the big one. But First: Why Are There So Many Gorillas? It’s a question worth asking due to the sheer number of intelligent gorillas roaming the DCU. Don’t get me wrong, Marvel has its own sentient apes, but not as many as its main competitor. The answer comes down to age, and not the silver one that most people associate with the proliferation of monkeys in media. 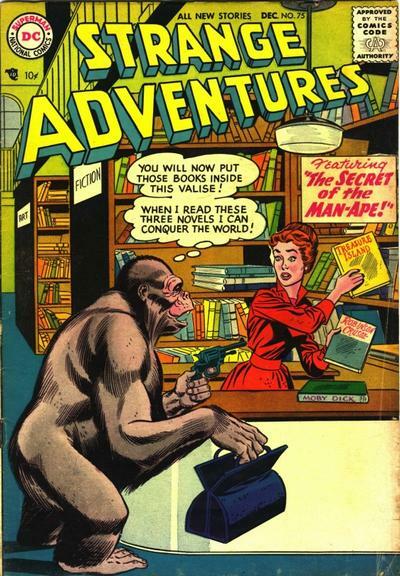 While the Silver Age is definitely known for its heavy use of science fiction tropes, gorillas were hardly absent from fiction or comics prior to the era of sci-fi shenanigans. Edgar Rice Burroughs introduced several ape characters in the Tarzan novels from 1912-1964 and the early Tarzan films featured his chimp pal Cheeta. During the Golden Age various jungle related comics had their title characters regularly confront enemies of the gorilla kind even if it was only on the cover. No, as a company, DC has been around longer and thus they’ve gone through at least two phases of popular culture where “gorilla movies” drove sales. From King Kong to the first Planet of the Apes franchise, giant and/or intelligent primates have never quite left the media landscape. DC Comics just happened to have more characters who survived the ebb and flow of popularity. Yes, I know The Flash has put Grodd much higher on the radar than anyone could’ve imagined, but he’s still an interesting character worth looking at a little more. Introduced in 1959, in the comics the residents of Gorilla City (originally located on regular old Earth-1) gained their intelligence from an alien who crashed landed in Africa, but it was later retconned as a radioactive meteor because comics! Grodd, upon gaining a massive boost to the old noggin, basically decides to start taking over the world, like immediately. The only variations of his plan usually involve taking over Gorilla City from intellectual rival King Solovar or deciding just to destroy humanity in general. Gotta change it up every once and a while. Like his television counterpart, Grodd is telepathic and telekinetic, which makes him a pretty formidable opponent for the Flash since Grodd’s disdain for humans in general makes it easy for him to use people as canon fodder in order to get the upper hand. There were, however, a number of plots where Grodd could change into a human and others where he took over a human’s mind almost permanently, so we’ll see how far the live action show wants to push it. 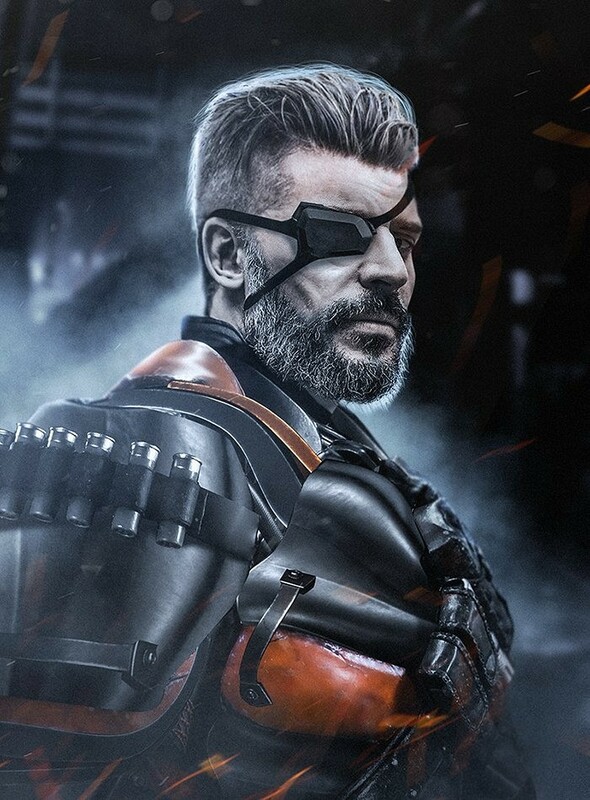 He’s also pretty game to team up with other villains – joining Lex Luthor’s Legion of Doom and Vandal Savage on numerous occasions – so keeping my fingers crossed for Captain Cold to show up on his doorstep in Earth-2! 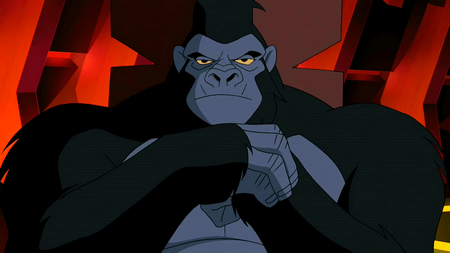 I do believe he also has the most television and video game appearances of any DC gorilla, showing up in everything from the Super Friends to Justice League: Unlimited to Lego Batman. 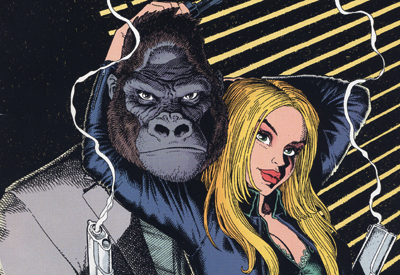 Part of the original group of gorillas gifted with hyper-intelligence, Solovar has been instrumental in keeping the peace between Gorilla City and the human world. Where Grodd seeks power, Solovar keeps his brilliant mind tempered with wisdom and humility. Which is probably why the two are always at odds, though it seems to depend largely on how into taking over the world Grodd is that day before settling on messing with Solovar. He’s definitely made a play for the throne plenty of times, but where his rival is concerned Grodd will go the extra mile to make the king’s life a living hell. For instance, Solovar fancied a female gorilla named Boka and intended to marry her. Grodd, learning of this thing called happiness and falling for Boka as well, built a machine that emitted a type of radiation that made others instantly like him, causing Boka to turn her affections towards him. Then he used it to become King of Gorilla City. Then he tried to take over Central City. That’s the world of gorillas in the DCU. 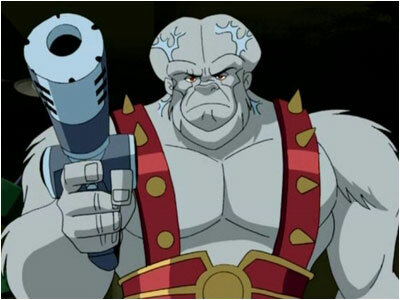 In the DC Animated Universe, however, Solovar appeared as the Chief of Security for Gorilla City sent to stop Grodd from, of course, taking over the world. Luckily, Flash and Green Lantern were there to lend a hand. Given the rivalry between Grodd and Solovar is a pretty major part of their backstory, it would be interesting if the live-action show tried to play this up. 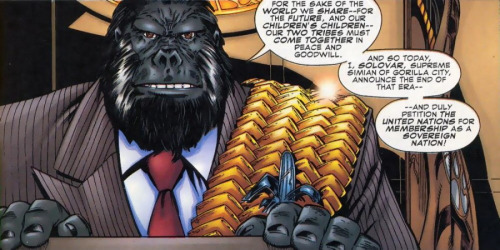 Since Grodd is a newcomer to the nascent haven for intelligent gorillas, it wouldn’t surprise me if he tried to take over the place with his opposition led by Solovar. It would be a great juxtaposition for the show as well, giving the STAR Labs team a group of allies against Grodd and his brood should the occasion arise. He may not be one of the more well known gorillas of the DCU, but this genetically modified white-furred gorilla is a favorite of mine purely because of his appearance in Gail Simone’s excellent Wonder Woman story, The Circle. 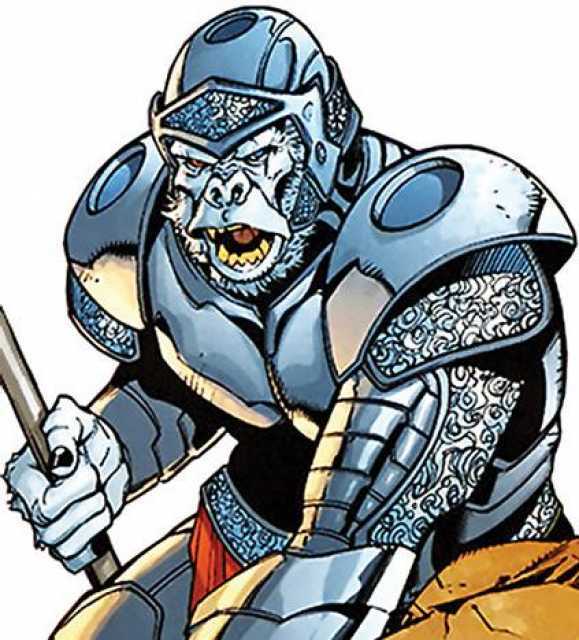 A former follower of Grodd’s, Tolifhar was and remains the leader of the Gorilla Knights, a group of gorilla warriors created purely to fight superpowered beings. Thankfully, Diana convinced them to switch sides and allowed them to stay in her home for a while. Hilarity definitely ensued. To be fair, it’s hard not to instantly like a gorilla in plated armor who also happens to sport one hell of a scar over his left eye. Plus he’s written by Gail Simone, so automatic awesome. Like Solovar, it wouldn’t be hard to work Tolifhar into Earth-2’s Gorilla City as either a supporter of Grodd’s or one of Solovar’s elite guard. Either way, it would be pretty cool to see Grodd fight one of his own kind and Tolifhar, without question, could give him a run for his money. Extra fun would be Barry and the rest of the STAR Labs gang working alongside another gorilla who is just as capable and intelligent as Grodd, only nicer. Or at least less gung-ho about killing all humans. A character who’s had an up and down career in the books, the Ultra-Humanite was one of Superman’s first recurring villains during the Golden Age until Lex Luthor rose in the ranks of Supes’s punch card. He was also a regular human being at the time with delusions of grandeur intent on taking over the world. Like ya do. When he was brought back during the Silver Age, he looked less man-like and more ape-like on account of transferring his consciousness into a large white-furred gorilla. Again, like ya do. Please note, though, that the Ultra-Humanite isn’t one of the Gorilla Knights turned bad. He’s just a dude crossing lines in science that man, or ape, was never meant to cross. His backstory changed here and there, but the running theme was that of a man constantly doing body swaps to keep his superior mind alive. Back in the 40s he even had his brain placed in the body of movie star Dolores Winters. It may have been a means to an end, but he wasn’t complaining about his time as a woman. Ultra-Humanite has made a few appearances in the DC Animated Universe where he’s taken on the very sci-fi form of a big-brained gorilla complete with throbbing veins to let us know just how smart he really is – just in case you didn’t know. I did appreciate the animators and the writers making him distinct from Grodd by giving him more refined tastes in music, art, and culture on top of his superior scientific skills. Again, it would be pretty fun to see the STAR Labs posse either going up against Ultra-Humanite or reluctantly working with him. The effects team has gotten pretty good at animating gorillas after two episode with Grodd, so I think this is right in their wheelhouse. After Grodd, Monsieur Mallah is my favorite of the DC Comics gorilla faction. 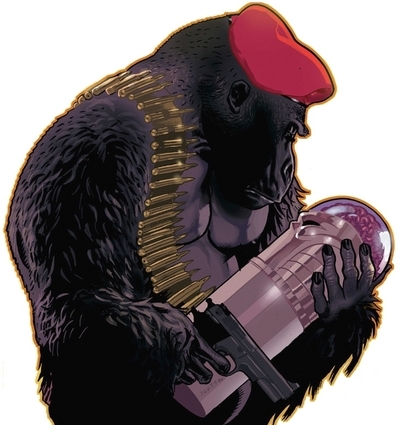 Seriously, it’s a gorilla with a beret and bandoleers toting a machine gun. 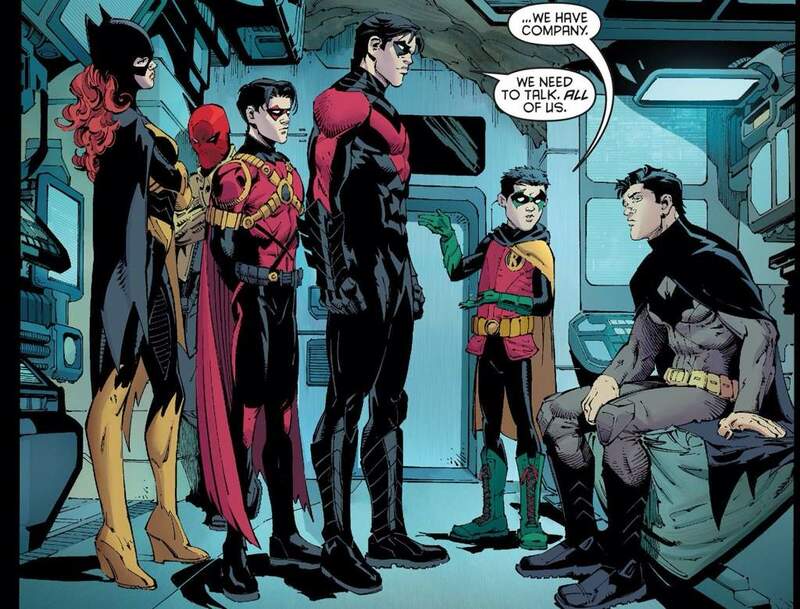 How can you not squeal with delight whenever he shows up to make life inconvenient for the Teen Titans? First appearing in Doom Patrol in 1964, Mallah was the result of experiments on animals by a French scientist trying to boost intelligence. Mallah was one of the success stories, reaching an IQ surpassing Einstein. When a colleague became jealous he rigged an explosion and made sure the object of his jealousy got caught in the blast. Only the brain survived, transferred to a computer network by Mallah and eventually stored in a cylindrical case that showed off the still functioning organ while sporting a sweet skull face. Now known as the Brain, Mallah served as his personal assistant and bodyguard, helping him create the Brotherhood of Evil and causing general mayhem. It wasn’t until Grant Morrison took over Doom Patrol in 1990 that any hints of romance sparked between Mallah and the Brain (yes, the joke has been made), but oh my did sparks fly! And like all of the crazy and insane ideas Morrison comes up with this one worked like gangbusters. Points to you if you find any of the fanfiction that’s sure to exist. The pair made frequent appearances on Teen Titans and Young Justice and proto-Superman even managed to take them down on Smallville. I can only imagine how awesome it would be to have Mallah and the Brain open one of the breaches between Earths 1 and 2 and wreak some havoc on Central City. Cisco would have a field day with these two. First appearing in 1964, Sam was the latter half of Angel and the Ape, acting as partner to the very human Angel O’Day while also working as a comic book artist. Simeon didn’t so much hide that he was an ape as the people around him just assumed the big, burly, hairy ape-like guy at the desk was just an ape-like dude. When the book was revived in the 1990s, Sam was revealed to be Gorilla Grodd’s grandson (though this conflicts with another book that claimed Sam was Grodd’s brother) and used his psychic powers to project the image of a human for people to see when they came to the detectives. Only when his concentration broke could others see him for what he was. This one might be a long shot for The Flash considering the familial relation to Grodd, but it would be pretty sweet if Joe West ran into a normal looking dude named Sam only to find out the guy is actually another psychic gorilla. Like nana Cross always said: You can never meet enough psychic gorillas. Don’t believe me? Go read Daniel Quinn’s Ishmael.